Hi. 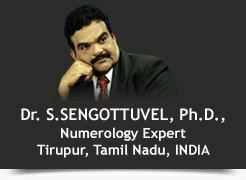 I am Dr.S.Sengottuvel I am a professional micro numerologist. I have been practicing Numerology from 1985. I have been successfully consulting people about themselves, their relationships, business and the future. Of all the occult sciences, “Sengs Systems” of numerology is the most powerful. A basic principle of “Sengs Systems” of Numerology is that all things in nature evolve in cycles that are measurable and predictable. I offer the truth with compassion and responsibility. Every individual has a power to change his or her life. With the help of “Sengs Systems” of Numerology, one can make successful life and make his or her dreams come true. I am just a channel to recognize you and your life. I am here to help people and guide you to how to become successful. In “Sengs Systems” of numerology all the numbers have a particular vibration which may or may not vibrate with each other. Every number has its unique quality. If the name number total doesn’t matches with the total of birth date number it comes to a bad total, then ill fortune, heart breaks, disease, quarrels, negative thinking and all kind of wrong things happen in life. Why Babies need Lucky names?